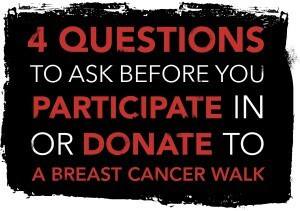 SAN FRANCISCO, CA–Breast Cancer Action (BCAction), the watchdog for the breast cancer movement, encourages would-be participants or donors of large-scale breast cancer walks and runs to carefully question where the money goes, in a new resource published today. The hosts of the largest walks and runs for breast cancer are Susan G. Komen, Avon Foundation, and the American Cancer Society. They advertise heavily and entice millions of people each year to walk or run to “save lives,” “find a cure,” and “end breast cancer.” The first such event this year is Avon’s “Walk to End Breast Cancer” in Houston, TX on April 23-24, 2016. Women have been voicing concerns about how much money raised from these walks is actually going to breast cancer programs and which types of programs are being funded, but they have yet to get satisfactory answers. In addition to issues of financial transparency, BCAction is also asking why large-scale breast cancer fundraising events often fail to include and recognize women who are dying of breast cancer. Komen, Avon and the American Cancer Society have also been guilty of ‘pinkwashing’, a term coined by BCAction to describe the hypocrisy of claiming to care about women with breast cancer while profiting off a product that increases women’s risk of the disease. How much money raised from the walk will go to breast cancer programs? What breast cancer programs will the walk fund? This new resource is part of BCAction’s Think Before You Pink® campaign, which since 2002 has called for accountability and transparency in breast cancer fundraising and marketing. ###Breast Cancer Action is a national education and advocacy nonprofit organization whose mission is to achieve health justice for all women at risk of and living with breast cancer. BCAction has a strict conflict of interest policy and refuses to accept corporate funding from companies or organizations that profit from or contribute to the breast cancer epidemic.